We produce fitness machines for globally reknown companies as well as young brands within our world class network of fitness factories. Get in touch with us if you plan on producing fitness machines. 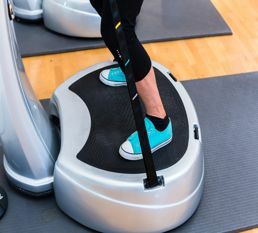 A full body vibration exercise machine is a platform that enables sportsmen and women to tighten their muscles and skin by standing or sitting on a vibrating plate. The plates vibrations cause the muscles to contract rapidly up to 3.000 times per minute. Vibration Exercise Machines come with and without handlebars or elastic straps depending on the skill level and age of the user. Elastic straps improve the upper bodies and arms. The vibrating motion plate is made of rubber which is comfortable to the feets or legs skin and trains 95% of the bodies muscles. The vibration is also a comfortable massage to all muscles and helps to release stress. Vibration Platforms burn fat, tone muscles and tighten skin, decrease stress, improve blood flow and reduce pains of sore joints and ankles. 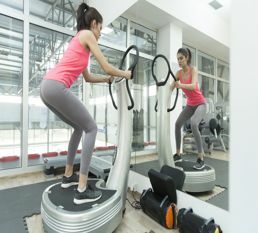 Key features are the thickness of the exercise machine, anti-slip feet with strong pressure absorption, as well as the quietness and safety of the machine when in use. When arranging a production, it is important to pre-plan the required maximum speed, the amount of speed levels, the size of the vibration plate, the maximum user weight as well as the target markets power connection.